If someone you were friends with has died, they will leave you a sum of gold in their will. A courier will approach you and say, "I've got a letter and a lot of gold. Something about it being your inheritance? Oh, and... sorry for your loss." He will hand over a random amount of gold and a letter of inheritance from the court of the hold that the person lived in. The base reward is 100 gold multiplied by your relationship rank with the victim. A fixed 10% tax is then applied. This quest does not appear in your journal. Sometimes your friend can be a generic NPC, such as an Arch Necromancer. Sometimes the note comes within mere minutes after the person has died. It is possible to receive inheritance from people that you have killed yourself. 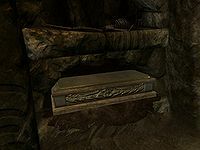 If you raise a friendly NPC with the master conjuration spell Dead Thrall, you may receive their inheritance after they are killed in combat, regardless of whether you have received it before. Rich victims were intended to have a base reward of 1000 gold, but no NPCs in the game are flagged as rich. Similarly, the tax applied can vary, but nothing ever alters its value from its default of 10%. If you already have a letter in your inventory, the new one will stack with the old one and the names will be the same on all of them. All of the quest stages are empty: 1. On the PC, it is possible to use the console to advance through the quest by entering setstage WIKill03 stage, where stage is the number of the stage you wish to complete. It is not possible to un-complete (i.e. go back) quest stages, but it is possible to clear all stages of the quest using resetquest WIKill03. This page was last modified on 26 January 2017, at 18:49.